We’d love your help. 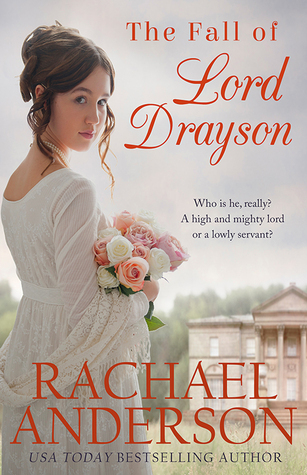 Let us know what’s wrong with this preview of The Fall of Lord Drayson by Rachael Anderson. When Colin Cavendish, the new earl of Drayson, informs Lucy Beresford that she and her mother need to vacate the house they've called home for the past two years, Lucy is fit to be tied. They have no money, no relations they can turn to for help, and nowhere to go. How dare the earl break the promise his father ha Who is he really? A high and mighty lord or a lowly servant? To ask other readers questions about The Fall of Lord Drayson, please sign up. Kindle freebie (again), Sept. 5, 2018, for this Regency romance. If sweet and warmhearted Regency romances are your literary crack of choice, go grab it! Lucy Beresford is the daughter of a poor vicar's widow. At the time of her father's death, she and her mother were lucky enough to receive an oral promise from the old earl of Drayson that they could continue living in the Yorkshire manor's dower house as long as they needed a home. Which they do, very badly. So Lucy takes it poorly when the old Kindle freebie (again), Sept. 5, 2018, for this Regency romance. If sweet and warmhearted Regency romances are your literary crack of choice, go grab it! Lucy Beresford is the daughter of a poor vicar's widow. At the time of her father's death, she and her mother were lucky enough to receive an oral promise from the old earl of Drayson that they could continue living in the Yorkshire manor's dower house as long as they needed a home. Which they do, very badly. So Lucy takes it poorly when the old earl dies and his son Colin Cavendish, the new earl, informs her that he's going to sell the (money pit) manor and that she and her mother need to vacate the dower house within two months. Lucy is a feisty young woman and she and the earl have a few words, upsetting them both. As he tears away from her house in an uncertain temper, his horse slips on mud and Colin falls, injuring his head and coming down with a (quite convenient) case of amnesia. Lucy and her maid rescue him and take him in, and when Lucy realizes that Colin has forgotten who he is, she can't resist telling him that he's her new servant, a butler/groomsman/general helper around the place. Colin has a hard time believing it's true -- it just doesn't feel right to him, but for the time being he puts up with it. Also partly because he's starting to find Lucy very attractive. I thought this might turn into one of those stories that makes me cringe internally out of sheer embarrassment for the characters and the fix they've gotten themselves into, but Rachael Anderson neatly avoided that (whew!). The last half of the novel got a little slow for me, but overall I enjoyed it and read it easily in one evening. Have you ever watched a Fred Astaire movie and thought how effortless his dancing seemed? In actuality, it was a lot of hard work and talent that made his dancing appear so graceful and easy. I kept thinking of that while reading this book and how effortless Rachael's transition from writing Contemporary romance to Regency romance was, when I'm sure a lot of hard work, research and talent went into it. I'm convinced Rachael can write and succeed in any genre and am personally grateful she has ta Have you ever watched a Fred Astaire movie and thought how effortless his dancing seemed? In actuality, it was a lot of hard work and talent that made his dancing appear so graceful and easy. I kept thinking of that while reading this book and how effortless Rachael's transition from writing Contemporary romance to Regency romance was, when I'm sure a lot of hard work, research and talent went into it. I'm convinced Rachael can write and succeed in any genre and am personally grateful she has taken a chance on writing regencies since it's my favorite genre and I always hoped she would write a regency. I was so excited for this one!! How could I not be? Rachael is one of my favorite authors and I love reading Regency romance. This was destined to be a perfect fit. It did not disappoint. From the characters to the story-line to the laugh out loud funny parts, I loved it all. I will get a full review up soon of all my rambling thoughts but for now, ahhhhh it was fabulous!!! I really just want to reread this book right now. It was so well done, I loved the characters, I loved the goodness of them, I loved the angst, I loved the setting and the flowers and the "lie" and the horses. I really loved it all!!! I loved the opening with Lucy explaining her decision to never lie and then when experiencing for the first time in her life being responsible while her mother was away for a few weeks she tells a lie. Granted she did it to help teach a lesson and to help keep her family from losing the only home they could afford. There was a quote that I highlighted while reading that I just loved. "Lucy suddenly felt more grown up than she had the day her mother had left her alone with Georgina. She realized then that maturity had little to do with independence and more to do with discovering that life wasn't all roses and lilies. It included thistles and thorns and complexities that a grown person faced head-on, with poise and courage, like her mother was doing now." That captures Lucy from start to finish for this book. She was anxious to prove to her mother and everyone else that she could be mature and responsible. She made a mistake and tried to fix it but several attempts didn't work to fix it at first. Her mother arrived home and she learned that she had to take the good times with the bad and learn from her mistakes. I loved Lucy and Colin(Lord Drayson). At first I wasn't sure I liked Colin and was so glad that Lucy told him he was her servant. It was great watching his transformation. (And I must say his clothing. Ha ha ha, his pink shirt.) I loved the moment he remembered who he was. I loved his mom and sister and the looks that passed between them all. I loved Mr. Shepherd, he was a steady loveable character. I loved Georgina, her relationship with Lucy, although not necessarily conventional, was sweet and a great strength. I had a great big grin on my face while reading this book. I picked it up and couldn't put it down! There's a warning for you...it is highly addictive and you might be sucked in like I was. Colin and Lucy are very cute together and the development of their relationship was great to watch. From cleaning the chimney to picking locks to horses and gardening, waltzes and balls, late nights and flowers, it was all well written. The silly banter back and forth between the two was very fun and very clever. I had many times where I giggled. :-D Yes I was giggling. Now that might not be the case for everyone but for me, I did! I will say that for the time period the characters did steal a lot of kisses where if they had truly done so and were caught kissing they would be forced to marry. There were moments where Lucy doubted Colin's love for her and times where he shut himself away but it all caused great angst for the storyline. Hopefully I'm not revealing too much here because it's one of those that is worth every minute of discovery throughout the reading. When I read the blurb for this one, I immediately requested it because it sounded like a really fun read. I wouldn't really say I went in with high expectations, but I definitely went in with high hopes. And let me tell you that I finished The Fall of Lord Drayson with a smile on my face because it totally delivered!! I can already tell you that I will be adding more of Rachael Anderson's tomes to my TBR! Chick lit galore, people!! So anyways! Allow me to divulge the synopsis, in case you decided you don't care about this book and just came to skim through my review! HAHA I'VE CAUGHT YOU RED-EYED (because you aren't really using your hands for anything)!! Lucy lives with her maid/servant Georgina (Georgy) and her widowed mother in the dower house of the Tanglewood estate in England. When Lucy's father the vicar died, the fourth Earl of Drayson, owner of Tanglewood, offered up the dower house as a home for the women, where they went to live a fairly happy and peaceful life. Fast forward a few years, the fourth earl has died and now his son Colin Cavendish, the fifth earl, is in charge, so to speak. The Draysons have been occupying another residence, but still own Tangelwood. Unfortunately, due to the lack of attention that Tanglewood had been receiving, it began to fall apart and Colin decided it was becoming a fancial burden. But wait! People live on that property! Remember Lucy and her squad of two? Yeah, Colin has to kick them out. Aaaaand he's kind of a jerk about it. Lucy, the headstrong girl she is, gets really mad at this incredibly dashing fellow for being so heartless and assuming it would be easy for them to take up new residence. Colin rides away on his Arabian when horsey hits a mud patch and Colin flies off, hitting his head in the process. And there he remains until Lucy's maid Georgy finds him. With no memory of who he is. Lucy jumps on the opportunity for revenge and tells him he's her servant, hoping to breed a humble nature with this blank canvas of a devilishly handsome man! I read right through this in two sittings! It would only have taken one, but you know.....sleep is a thing, unfortunately. It was absolutely adorable! I loooooved the banter between Lucy and Colin and the fire that slowly burned brighter and brighter between them! My chest tightened with all the feels!! The change in Colin was remarkable! It was so awesome to see how a few days as a helping hand gave him a new respect for others below his station. Lucy reminded me of myself in someways! I'm pretty headstrong sometimes and I happen to be fluent in sarcasm as well! Would I recommend this? I dunno. Is the sky up? Utterly charming. Totally hilarious. I loved how self-aware Lucy is. She is very observant of how her conflict over her deception grows as she comes to know "Collins"... and she is the one who learns a lesson as well as he. She is a bit of an odd duck, not conforming to society's standards and perfectly willing to live her life as a spinster because of it. The root of her rebelliousness however is her thoughtful and accepting nature, which makes her easier to sympathize with. Colin does make a r Utterly charming. Totally hilarious. I loved how self-aware Lucy is. She is very observant of how her conflict over her deception grows as she comes to know "Collins"... and she is the one who learns a lesson as well as he. She is a bit of an odd duck, not conforming to society's standards and perfectly willing to live her life as a spinster because of it. The root of her rebelliousness however is her thoughtful and accepting nature, which makes her easier to sympathize with. Colin does make a rather bad impression on her, but he surprises her with his work ethic and hidden compassion. Their developing friendship and attraction is sweet and the sassy banter between them feels natural to their characters. Lucy's maid, mother, and various neighbors make up a well-rounded cast that enhances the story. I thoroughly enjoyed every moment of this book! Highly recommend to fans of Regency and sweet romance. Wonderful surprise. I have never read this author before. Review to come later, but if you are a Regency fan I highly recommend. Without a doubt one of my favorite books of the year. I may have found my new favorite Regency author. Great characters, wonderful plot. Hilarious twists. You'll love this one. I let this review go a week or so, so I'm afraid it's not going to be terribly detailed. I enjoyed the story and characters and the plot flowed pretty well. There were a few times I was concerned that the story was taking a turn for cliché or unreasonable authorial manipulation, but Anderson sidestepped each time and I was very glad for that. Even the memory loss bits (which is an invitation to cliché if anything is) were handled well enough not to quibble about the contrivance. My biggest conce I let this review go a week or so, so I'm afraid it's not going to be terribly detailed. I enjoyed the story and characters and the plot flowed pretty well. There were a few times I was concerned that the story was taking a turn for cliché or unreasonable authorial manipulation, but Anderson sidestepped each time and I was very glad for that. Even the memory loss bits (which is an invitation to cliché if anything is) were handled well enough not to quibble about the contrivance. My biggest concern was the return of Colin's memory and the inevitable changes/revelations that would ensue. So I was extremely gratified with how well that worked out. And I loved how Lucy was determined to make things right and had the courage to come clean. And having (view spoiler)[Colin be the one to interrupt her confession, repeatedly, (because he knew what she wanted to say and didn't want their situation to change just yet) worked extremely well—because it meant she wasn't being weak or silly and it allowed both to make a choice to be their better selves. I liked that he wanted to remain in their secluded idyll at the cost of interrupting her attempts at confession and that worked to cement his character and the change he wanted to make in his life to have Lucy be part of it (hide spoiler)]. So this turned out to be a satisfying read and very enjoyable despite relying on the amnesia crutch to begin with. There's enough weakness in the setting and some of the minor events that I can't give it full stars, but it's a decent-enough read for all four. The opening premise and at times a too-modern voice make it a weak four, but I liked the characters enough not to quibble too much about it. Oh my goodness! I can't think of anything that I didn't love about this book. I loved the time period, the setting, the characters, the plot, .....etc. I felt let down because it ended. Lucy and her mother live in a dowager house on a property (Tanglewood) that is about to be sold. When Colin informs Lucy that she must vacate the property you can tell that there are a few sparks, but they are on opposite sides of the issue. Lucy and her mother can't afford to live anywhere else and for Colin it i Oh my goodness! I can't think of anything that I didn't love about this book. I loved the time period, the setting, the characters, the plot, .....etc. I felt let down because it ended. Lucy and her mother live in a dowager house on a property (Tanglewood) that is about to be sold. When Colin informs Lucy that she must vacate the property you can tell that there are a few sparks, but they are on opposite sides of the issue. Lucy and her mother can't afford to live anywhere else and for Colin it is business. He is getting rid of an unprofitable piece of real estate. Colin and Lucy compliment each other in so many ways. Their patience and understanding of the other is fun, particularly due to the circumstances, Lucy has lead Colin to believe he is her servant after he looses his memory from a fall off of his horse. The sparks fly between the two, but she is living a lie and doesn't know how to make it right. The secondary characters are wonderful. It looks as if Rachael Anderson is planning on making this into a series. I would love to find out more about the people in the community. I found them to be an eclectic group and want to get to know them better. This is a clean romance with kissing. Sometimes I get a little nervous when a favorite author delves into a new genre, but my worries were completely unfounded with Rachael Anderson. She is completely brilliant! Lucy is charming, feisty, and absolutely adorable. She is a character that is easy to like and one whom I would love to be friends with in real life. Colin is pompous and cocky, but his experiences soften him a little and make him endearing. I just couldn't get enough of them and their relationship. This story had me laughing Sometimes I get a little nervous when a favorite author delves into a new genre, but my worries were completely unfounded with Rachael Anderson. She is completely brilliant! This story had me laughing, swooning, and eagerly devouring each and every single page. I absolutely adored this couple's interactions, especially as they got to know each other better. The more tangled their stories and lives became, the more I engaged I became. At the end of the book, the author mentions possibly turning this into a series and I'm crossing every finger and toe in hopes that she does in fact do just that. I can't say enough good about this book. This story was exactly what I needed--a lighthearted, clean, romantic comedy set in Regency times. Loved it! Content: mild, swoony romance (clean). I really enjoyed this author’s Meet Your Match series and various standalone novels and wondered how she would do in a different genre. The answer is wow! Bestselling contemporary romance author Rachael Anderson can write historical traditional Regency Era romance as well. Most of my personal reader community friends like sunshine, rainbows, and sweet candy precipitation happiness escape from real life in their novels, while I like realistic relatable characters instead who have overcome trials, I really enjoyed this author’s Meet Your Match series and various standalone novels and wondered how she would do in a different genre. The answer is wow! Bestselling contemporary romance author Rachael Anderson can write historical traditional Regency Era romance as well. Most of my personal reader community friends like sunshine, rainbows, and sweet candy precipitation happiness escape from real life in their novels, while I like realistic relatable characters instead who have overcome trials, adversity, and hardships either in their prior history or during the novel and come out stronger. I especially love that in my Regency novel characters as that era sociologically has plenty of material to mine from. Michele Paige Holmes is one of my favorite authors in that regard that I also highly recommend. Rachael Anderson has the ability to satisfy both me and the aforementioned friends. She has the interesting dichotomy in The Fall of Lord Drayson and the other novels I have read of hers of both providing a fun romance that is escape from everyday life, but also exercising your mind and heart just like I like. The heroine Lucy Beresford tells the hero Collin, the Earl of Drayson, that he was just her lowly servant after he lost his memory due to brain trauma from blunt force injury at great speed during an accident. Lucy has no problem though a gentlewoman to do manual labor. This was a great vehicle to have the hero and heroine spend inordinate amount of time alone unchaperoned you normally wouldn’t have in a traditional regency setting. Servants in the Regency Era are like background decorations who do there service very unobtrusively and are not given much attention when in a room or outdoors so seem to have different rules of propriety to be around alone. I really enjoyed the honest banter between these two without the drawing room/ballroom society formality. The romance was believable and I loved the journey. Loved Lucy and Colin! I also really enjoyed the side courtship between Mr. Shepherd and Lucy’s mom Mrs. Beresford. Mr. Shepherd was another awesome romantic hero! I believe this is going to be a series and I hope the handsome dark brooding emotionally hardened Mr. Ludlow is the romantic hero of the next novel. He appears near the end of the novel at a ball for Lucy’s honor and I loved the brief spark of joy and humor he had before it was crushed and he returned to coolness again. I am curious to know how he got emotionally hardened and want Mr. Ludlow to find his own happily ever after. Sensuality content: Clean secular traditional regency romance. Kisses only. Source: Received a free mobi copy from a third party. No review was required of recipient, but a review with my honest opinion much appreciated of course. Rachael Anderson? I love you. I know this probably seems redundant coming from me but Rachel Anderson writes books so perfectly for me. Every single time. It is so easy to settle right in with Rachael's books and just stay there from beginning to end. This is her first dip into the regency genre and I am so, so happy. She did it! She did it! She really, really did it! :) And I am just as in love with her regency as I am with her contemporary books. I love the set up for this book. It starts out Rachael Anderson? I love you. I love the set up for this book. It starts out with the Earl of Drayson, kind of full of himself, delivering a notice to vacate to Lucy. Lucy, in a moment of pure human frustration, takes advantage of the Earl's misfortune and capitalizes on it. She is determined to teach that high and mighty Lord a lesson or two. It is all so comical and Lucy is quite pleased with herself until she finds herself falling for Drayson. Oops. That wasn't supposed to happen. And in her growing web of lies, she doesn't know how to make things right again. I read through this book so quickly. I loved every single minute of it. Lucy is such a fun character- full of life and love. I couldn't help but smile through most of this book. Drayson actually surprised me. I didn't much care for him in the beginning but even when I began liking him, he still surprised me. I love when that happens. So, it's a big, fat LOVE from me for this book. I really, really hope that Rachael is working on the next book and that I will get to read it soon! Decided to DNF at 50%. It wasn't a bad little story overall - kinda amusing, a bit slow-paced, interesting characters - but it was also hugely disrespectful of horses - occasionally referring to them as "it" and switching genders - and even the "experienced horseman" doesn't know how to hold a lead rope (he twists it around his hand) or that you don't primarily guide a horse with the reins unless you're a jerk. ¿Qué puedo decir de esta historia? Es la típica que debería haberme sacado de mis casillas y sin embargo no ha sido así. He disfrutado leyéndola y ha sido muy entretenida. -Su poquito de mentiras incontroladas. -Su poquito de nunca es buen momento para decir la verdad. -Su muchito de separación You can find this review in English below. Pero al final resulta que todos los poquitos mezclan bien y el resultado funciona. Puede ser porque la autora no se lo toma todo muy en serio y se deja llevar…y yo me dejé llevar también. Es gratis, así que… sírvase usted mismo. What can I say about this story? That it should have rubbed me the wrong way and, instead, I have enjoyed it and had a pleasant time reading it. -A little bit of amnesia. -A little bit of out of control lies. -A little bit of Never comes the right time to tell the truth. But at the end, all the little bits mixed well and the result worked fine. Maybe it was because the author didn´t take it all seriously and went with the flow… same like me. It´s free, so, serve yourself. I absolutely adored The Fall of Lord Drayson. Lucy and Colin will whisk you away into the time period and steal your heart with laughter and chemistry. Such a fun, clean, regency romance. I can't wait for book 2 of the Tanglewood series! It was a bit slow towards the end - the scenes with the flower arrangements could have been edited out - but it deserves an extra star for being clean and also a freebie. A nice book for a lazy afternoon. I liked the premise of teaching him a lesson by telling him he is the servant when she found out he has lost his memory. 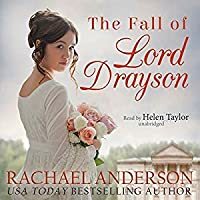 THE FALL OF LORD DRAYSON was the perfect Regency romance! With refreshing characters, witty dialogue, some fabulous romantic tension, and swoon-worthy moments, this was lovable and sweet from beginning to end! Highly recommended to those who enjoy just plain good and sweet Regency romance. I absolutely adored Lucy! She's spunky, intelligent, has a great sense of humor, is loyal, and is also quite honest, except when she's not, of course. ;) The predicament she got herself into... so very hilariou THE FALL OF LORD DRAYSON was the perfect Regency romance! With refreshing characters, witty dialogue, some fabulous romantic tension, and swoon-worthy moments, this was lovable and sweet from beginning to end! Highly recommended to those who enjoy just plain good and sweet Regency romance. I absolutely adored Lucy! She's spunky, intelligent, has a great sense of humor, is loyal, and is also quite honest, except when she's not, of course. ;) The predicament she got herself into... so very hilarious and heartbreaking as well. I also couldn't help but fall in love with Colin. The way he takes on his new identity while also still acting like an earl... well, it's priceless really and leads to so much fun! Then there were other characters that came alive and that I loved who rounded out this story. I have to say that this story was engaging the whole way through. Not once did I lose interest. How could I with the crazy situation, with the delightful banter, the friendships and family relationships, and whole suspense of what would happen between Lucy and Colin, but also what would happen when Colin found out... Then there was the romance. It was sweet and swoon-worthy. In the end, was it what I wished for? Yes!! When I said this was a perfect Regency romance, I meant it. I loved the characters, the setting, the dialogue, the romance... What else could a gal ask for? Absolutely nothing. I am happily content. Aw, this was a such a fun and cute read. Loved it!!! I'm a big fan of Rachael Anderson and this book was wonderful!! I loved loved loved Lucy. From her whit and charm to her quick tongue and huge heart. I LOVE when authors write such realistic characters that I could easily become friends with!! Writing every scene so that it can be pictured perfectly is indeed a talent that Mrs Anderson has mastered! This is a clean romance with some thoroughly kissed scenes and great chemistry between the main characters, highly recommended!! There are some authors that you just know are safe reads for you. They may not always hit a home run but their books will nearly always be enjoyed and not hit any of your pet peeves. Rachael Anderson is one of these authors for me. She's a clean author which doesn't work for everyone but since she writes love stories, I don't care one way or another. I just want a fun, believable, love story that emphasizes a connection that is much more than physical and that's what her books are. This book won' There are some authors that you just know are safe reads for you. They may not always hit a home run but their books will nearly always be enjoyed and not hit any of your pet peeves. Rachael Anderson is one of these authors for me. She's a clean author which doesn't work for everyone but since she writes love stories, I don't care one way or another. I just want a fun, believable, love story that emphasizes a connection that is much more than physical and that's what her books are. This book won't stand out in the long run but I found it a nice escape for a bit. It's a historical but probably not all that accurate for those that need it. Rather it caters to our present day feminist sensibilities which is a plus for me since some historicals come off too repressive (and sadly probably the most accurate ones at that). The hero isn't super likable at the start but does show nice growth. I liked the heroine even before she started to show growth. The book really doesn't try to be anything other than a fun escapist book so it fit the bill perfectly for what I needed. Plus, it isn't overly long or drawn out. I haven't had a lot of time to be swept away by a book and this was just about the pefect length. Lucy Beresford is the daughter of the late vicar and a seamstress. Thanks to the generosity of the Earl of Drayson, she and her widowed mother live a somewhat comfortable life in the dower house of Tanglewood Manor. But now Colin Cavendish is the 5th Earl of Drayson and he intends to sell Tanglewood Manor. After delivering his cold, unfeeling eviction notice to Lucy, he has an accident and hits his head. And doesn't remember who he is. Conveniently forgetting her promise not to lie, and completel Lucy Beresford is the daughter of the late vicar and a seamstress. Thanks to the generosity of the Earl of Drayson, she and her widowed mother live a somewhat comfortable life in the dower house of Tanglewood Manor. But now Colin Cavendish is the 5th Earl of Drayson and he intends to sell Tanglewood Manor. After delivering his cold, unfeeling eviction notice to Lucy, he has an accident and hits his head. And doesn't remember who he is. Conveniently forgetting her promise not to lie, and completely ignoring the lessons she learned from her father -- particularly about The Good Samaritan -- she lies to the Earl. She promptly tells him his name is Collins and that he is her butler, footman and coachman. As Lucy comes to see another side of Colin, she doesn't know how to get herself out of the predicament she has created. Even as her servant, he is high-handed and bossy and Lucy is sure that once he discovers the truth he will never forgive her! This was a great start to a new series! I was glad to read that there will be more books written in this series -- I am very curious about Mr. Ludlow and Harriett and I have a feeling we will be seeing them in future books. If you want a fun, sweet Regency romance this is the story to read! When Colin Cavendish becomes Earl of Drayson, he never expected the likes of Lucy Beresford. Lucy and her mother now need to vacate their home of two years after being promised sanctuary by the old Earl of Drayson, Colin’s late father. Lucy discovers the earl after a terrible accident and realizes he has lost his memory. Lucy takes it upon herself to teach the earl a lesson in humility as her servant. However, she was not expect If you want a fun, sweet Regency romance this is the story to read! When Colin Cavendish becomes Earl of Drayson, he never expected the likes of Lucy Beresford. Lucy and her mother now need to vacate their home of two years after being promised sanctuary by the old Earl of Drayson, Colin’s late father. Lucy discovers the earl after a terrible accident and realizes he has lost his memory. Lucy takes it upon herself to teach the earl a lesson in humility as her servant. However, she was not expecting what would come to follow. I loved Lucy and her spunky attitude. She values hard work and humility. I loved reading about all her adventure and witty personality. I feel I can relate to her on so many levels. Colin came across as high and mighty but you soon learn he is so fun and charming. I enjoyed watching their relationship grow and blossom into something beautiful. This fun loving tale was such a joy to read. I loved that it was a clean romance that was a true delight to read. I highly recommend this book to anyone who needs a quick fix of fun and romance. **I voluntarily reviewed and Advanced Reader Copy of this book from Inspired Kathy. When Lucy Bereford’s father died, the Earl of Drayson promised her mother the use of the dower house at Tanglewood for as long as needed. Now the earl has passed away, and his son, Colin Cavendish, has inherited the title. Colin decides that he wants to sell the unused estate of Tanglewood. When Lucy is informed that she and her mother must vacate the dower house as soon as possible, she is furious with the new earl. That night, she finds the earl unconscious in the middle of the road. When he w When Lucy Bereford’s father died, the Earl of Drayson promised her mother the use of the dower house at Tanglewood for as long as needed. Now the earl has passed away, and his son, Colin Cavendish, has inherited the title. Colin decides that he wants to sell the unused estate of Tanglewood. When Lucy is informed that she and her mother must vacate the dower house as soon as possible, she is furious with the new earl. That night, she finds the earl unconscious in the middle of the road. When he wakes up with no recollection of who he is, she decides he needs to learn some humility. So, she tells the earl that he is her servant. I read the description of this book and started laughing. An earl being a servant? I couldn’t wait to read it! I loved it from the beginning and was captivated throughout. As I read, I kept wondering when Colin would find out, how he would find out, how he would react and what Lucy would do. I loved the way it all unfolded! I was smiling, laughing, swooning, and sighing through the whole book. This is one I will definitely re-read! This was a really fun, clean, romantic, Regency novel. Colin, the new early of Drayson, meets Lucy with the intent to kick her out of her home so that he can sell the estate. The meeting does not go well and when he falls off his horse and loses his memory, Lucy tells him that he is her servant, with the intent to teach him good manners, humility, and selflessness. What ensues is a lovely, unlikely romance with two very likeable people. I really liked the main characters. After you get to know L This was a really fun, clean, romantic, Regency novel. If you like clean, romantic, historical fiction, I highly recommend this book! Adorable and clean regency romance. Will definitely be reading Rachael's other books in this fun series. Loved it. An unexpected story. Rachael Anderson kept me on my toes with this lovely historical romance.